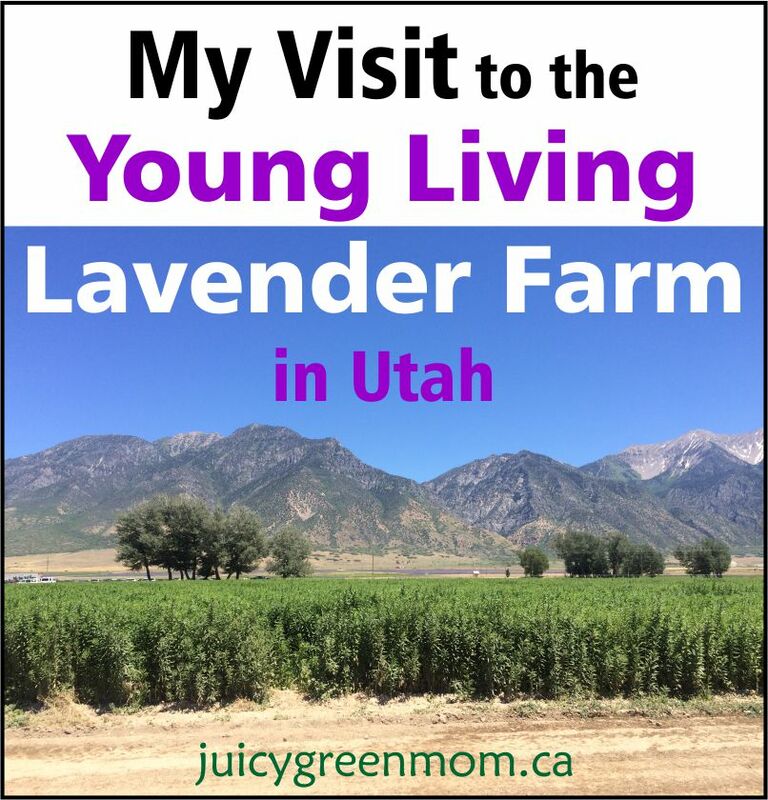 I was really excited to attend my first ever Young Living International Grand Convention in Salt Lake City this past June because one of the perks of attending was getting to visit the Young Living lavender farm in Utah. Here’s what it was like! The Whispering Springs Farm in Mona, Utah, is surrounded by mountains, and has over 1,400 acres of fragrant herbs – the largest herb farm and distillery in the world. It has fields and fields of lavender, along with many other plants used to make Young Living’s essential oils. 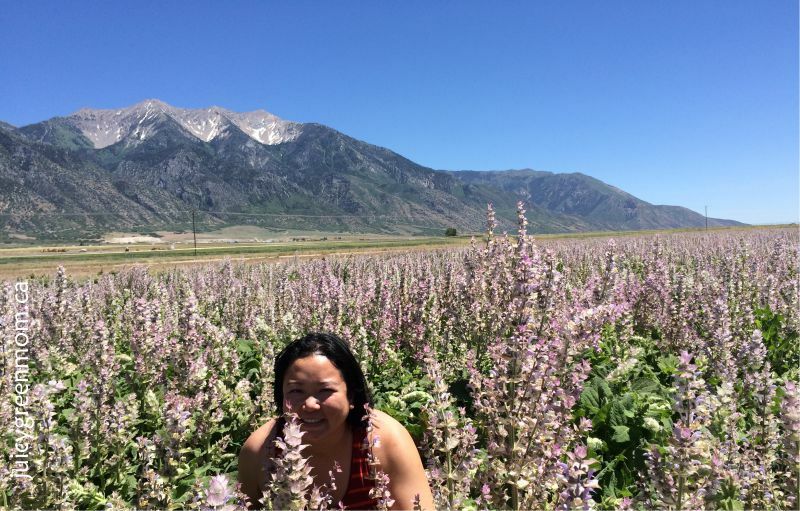 Here I am in a field of Clary Sage! Cool, right? I loved being in the thick of it and smelling those lovely flowers! There were SO many other plants to see and too many pictures to show. Some others that I saw included: Roman Chamomile, Fennel, Wolfberry, Tri Color Sage, Thyme, Hyssop, Oregano, Winter Savory, White Yarrow, Tansy, Spearmint, Gallardia, Melissa, and Golden Rod. Quite a varied collection of crops! It was really neat to see the plants in person and get to touch and smell them! 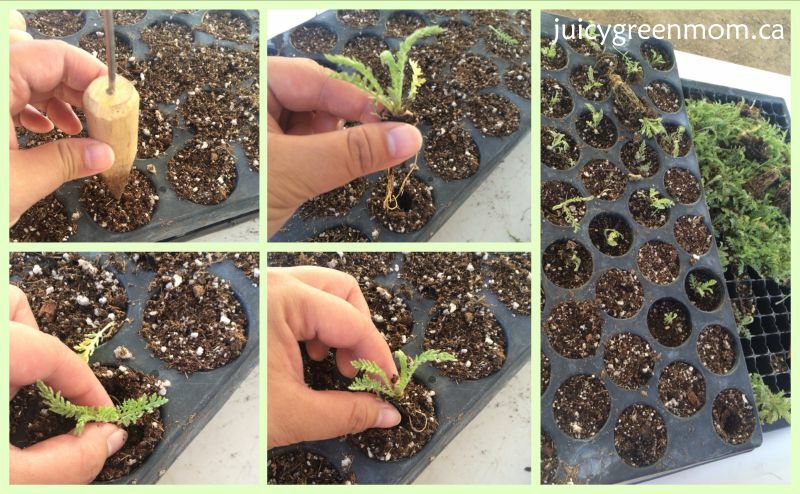 I also got the opportunity to plant some Yarrow seedlings which are then grown in the greenhouses, and then planted into the fields. Yarrow essential oil is not sold as a single oil, but is found in some important blends such as Dragon Time (another one of my absolute favourites – it also contains Clary Sage), and Mister. And here is the building where the distillation takes place!! So excited to go inside! The plant matter is first put into these huge vats. They sit on top of a large sieve in the bottom of the vat, and steam comes up from underneath to extract the oil. This is what is underneath those huge vats! You can see liquid and essential oil coming down from the steam distillation. The dark blue liquid you see sitting on top of the other liquid is Blue Yarrow essential oil! 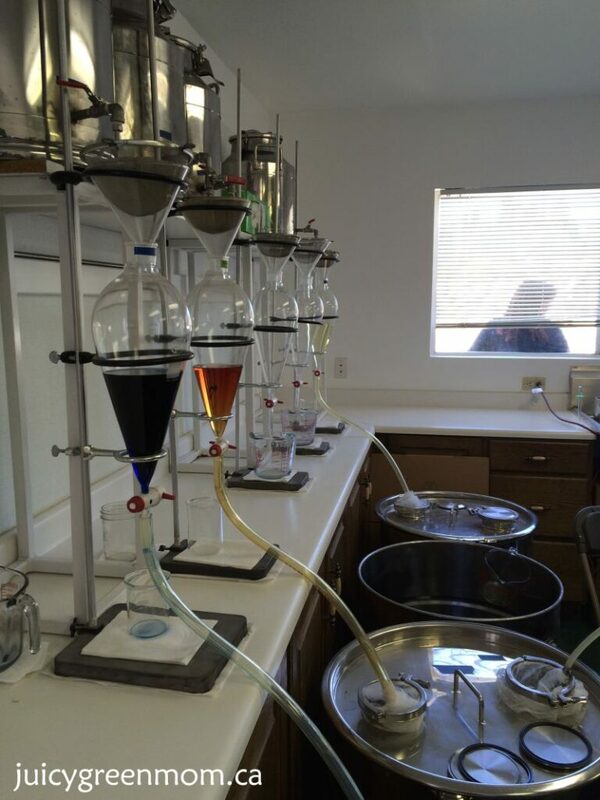 The setup is such that many different kinds of essential oils can be distilled at the same time! These have Juniper essential oil in them. 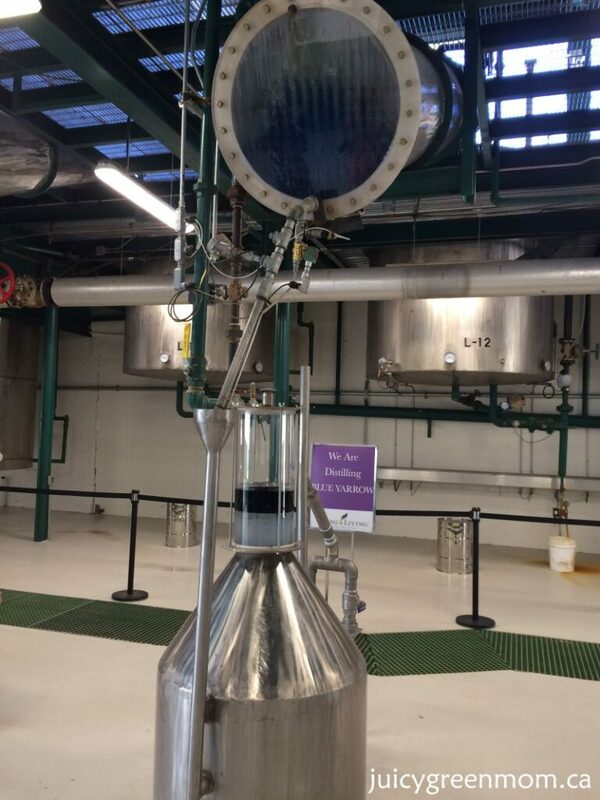 The final stage is separating the essential oil from the rest of the liquid that resulted from the steam distillation. Here you see both Blue Yarrow and Juniper. 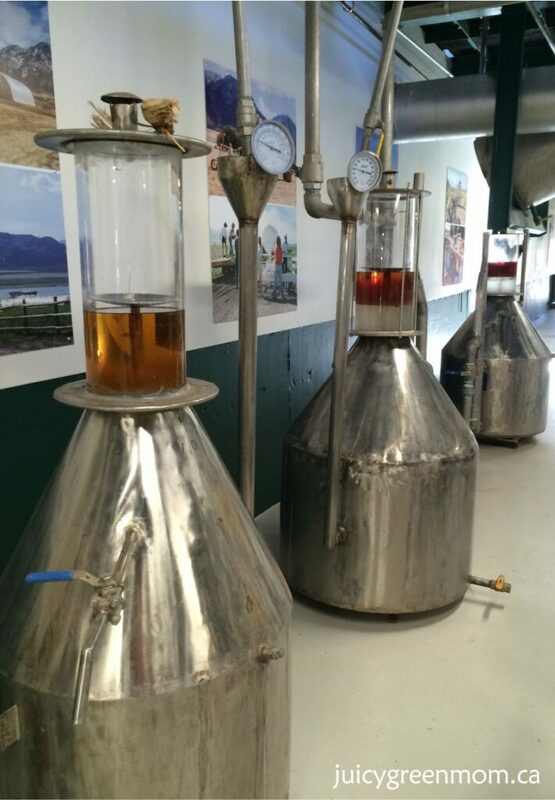 After going through rigorous quality testing, this is then what feeds into the machines that fill your precious bottles of essential oil! Other highlights of my farm visit was the cafe where I got to eat lavender ice cream (I fell IN LOVE with this and need to find a good recipe for it now! ), peppermint ice cream, and lavender lemonade. WOW!!! Totally amazing and delicious! 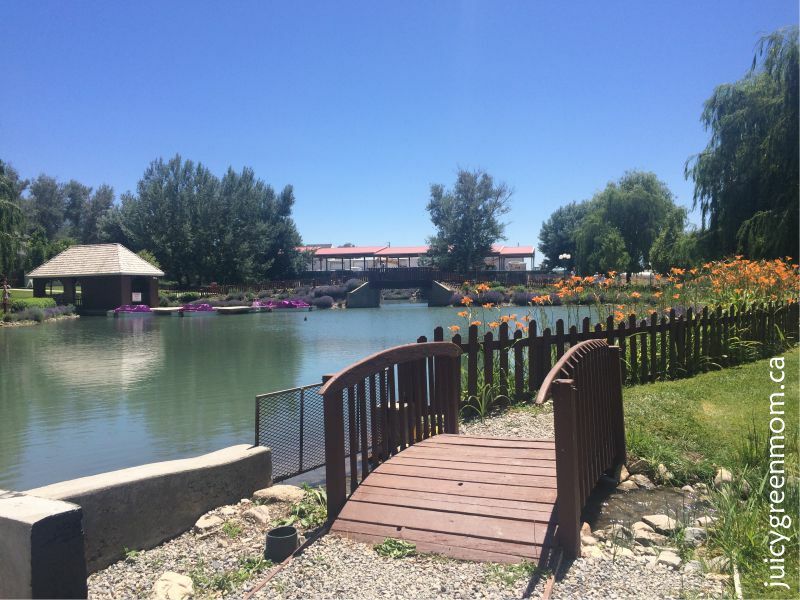 The farm has lots of other cool stuff to look at, like picturesque gardens and a little stream coming off this pond, the greenhouses and farm equipment, and a jousting arena (yes they actually put on jousting matches for visitors!). 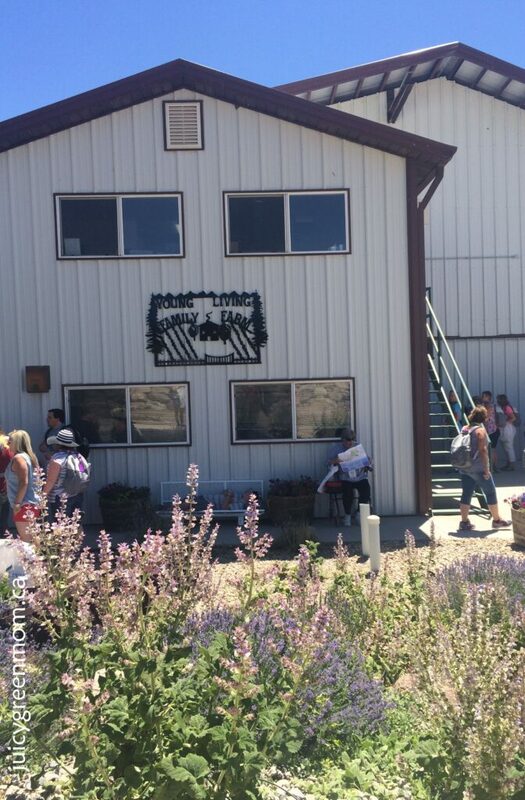 All in all, my visit to the Young Living lavender farm in Utah was an amazing experience. Not only was it beautiful, it was also really cool to see the true process behind Young Living’s Seed to Seal commitment. 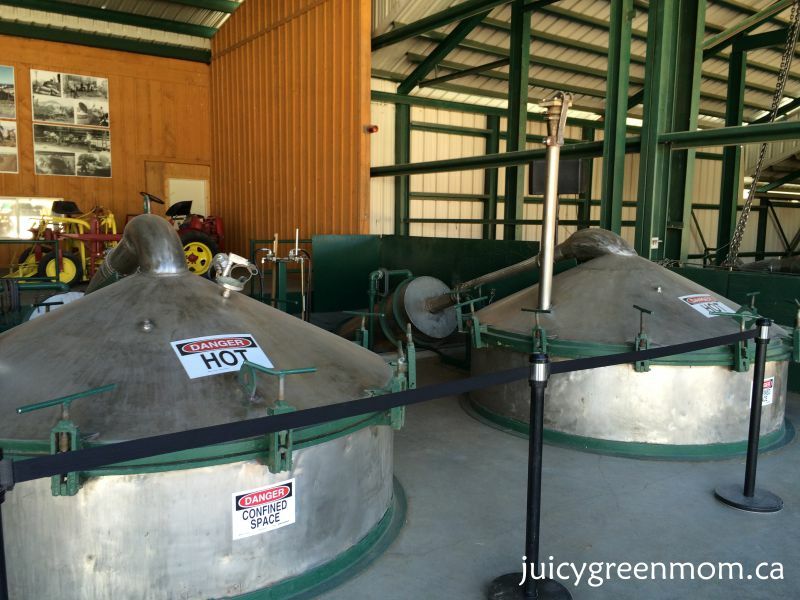 No other essential oils company has farms that you can visit and see the process of creating essential oils. For someone like me who is very particular about buying organic food and trying to ensure I know where it comes from, it just makes sense that I would want the same for the essential oils I use. Young Living has farms all over the world that people are welcome to visit, including farms in Idaho, France, Ecuador, Oman, and now British Columbia, Canada (opening to the public in August 2016!). What Young Living farm would you like to visit? Such a great time – I hope one day to get over to the USA and se it for myself!